Below is a copy of my term paper written for my Cell Biology course. I wrote it in a slightly less-formal style of scientific journalism, but didn’t spare on the technical details. Feedback, good or bad, is appreciated. Caffeine is a molecular compound from a family of compounds called Xanthines, which is a tri-methylated purine-derivative (containing 2 amide groups via deactivation of the aromatic ring). (Gale) The inclusion of Nitrogen atoms means it is also part of the group of compounds known as Alkaloids, sharing a molecular bloodline with Nicotine, Cocaine, Quinine, and the opiates. There are many other purine-derivatives, all sharing the bi-cyclic six and five-membered rings. Occasionally, our bodies will be expecting one member of this family, but get a case of mistaken identity and employ another. This phenomenon occurs with the likes of opiates such as morphine, which the body mistakes for Endorphins, the naturally-produced chemical responsible for the “runner’s high”. In the case of caffeine, the naturally occurring chemical is Adenosine. 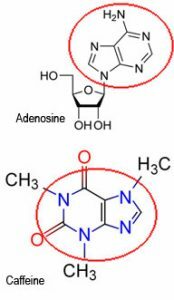 Adenosine, like Caffeine, is a purine-derivative. It is a very ubiquitous chemical in biological systems. It’s the “A” in “ATP” (Adenosine Tri-phosphate), a compound that temporarily stores free-energy during biochemical transactions. It’s also what is used to build the “sugar phosphate backbone” of DNA, the famous anti-parallel double-stranded polymer that holds the secrets to our genetic makeup. Adenosine is also the “A” in cAMP (cyclic-Adenosine Mono-phosphate), an intermediate chemical used as a secondary transmitter of signals. Adenosine’s precursor, Adenine, is one of the nitrogenous bases used in genetic code (the “A” in “A, T, G, C”). Adenosine is a purine base, sporting an amine (NH2) group and a Ribose side-kick. This agonist / antagonist relationship is found, among Caffeine and Adenosine. Caffeine affects us at the molecular level by competitively inhibiting the binding of Adenosine (Corradetti et al. ), indirectly resulting in lower levels of cAMP and higher levels of norepinephrine (also known as “noradrenaline”) (Gale, Greene et al.) and dopamine (Cieslak et al.). Caffeine does not necessarily give us energy; rather, it prevents the biochemical pathway, of which Adenosine is a part, that would otherwise make us feel tired. Adenosine receptors are a small family of extracellular docks that are classified as “purinergic receptors”, since they bind to purine-based ligands. There are three main types, noted by subscripts: A1, A2, and A3. While all three varieties are pervasively distributed throughout the central nervous system, the noteworthy interactions with caffeine are mainly with the first two types, which are more abundant than the latter anyways (Cieslak et al.). Adenosine receptor A1 is responsible, in this context, for inhibiting the activity of Adenylate Cyclase, the enzyme responsible for the creation of cAMP, by coupling with the Gi subfamily of G-proteins (Cieslak et al.). Activation of this receptor, via Adenosine binding, also inhibits the release of norepinephrine (Green et al. ), and simultaneously opens potassium channels while closing calcium channels (Cieslak et al. ), which possibly serves to depolarize the membrane potential and sequester available Calcium. The A1 receptor also has two affinity states, a “high” and “low” state (Corradetti et al. ), each of which serves a slightly different function: the low-affinity state receptors, when activated, inhibit the release of Acetylcholine (ibid), while the high-affinity variety, as a ternary complex of receptor + ligand + N-protein, are the ones that inhibit Adenylate Cyclase (the enzyme responsible for catalyzing the formation of cAMP). In short, the A1 receptors are the ones that are responsible for decreasing the amount of cAMP and contributing to the stabilization of the membrane potential. The second set of Adenosine receptors, A2a and A2b, of which only A2a is of relevance here, have a separate-but-related role. The one key difference is the company kept by these receptors: they co-localize almost exclusively with dopaminergic D2 receptors (Cieslak et al.). It wouldn’t be entirely accurate to say that it’s a friendly relationship though; The A2a receptors have a nasty habit of being the alpha-male among D2 and A1 receptors. When A2a are activated, they cause the agonists of D2 receptors to have a lower affinity (ibid), meaning it takes higher concentrations of dopamine to activate the D2 receptor pathway. When A1 receptors are also found near A2a (in heteromeric receptor complexes), the activation of A2a results in a decrease in binding on A1, although this could simply be because Adenosine has a higher affinity for A2a receptors, requiring only nano-molar quantities compared to A1‘s micro-molar requirements. This just further contributes to the alpha-male machismo of A2a. Perhaps the most significant contribution of these receptors, though, is that activation of A2a in animals results in sedation and catalepsy, as well as activating Adenylate Cyclase, increasing the amount of cAMP available. Cyclo-Adenosine Monophosphate, or cAMP, is what’s known as a “secondary signal.” This simply means that when a neurotransmitter docks at a receptor, cAMP will be produced to ride through the cell like Paul Revere, activating other intra-cellular sites, causing a cascade of reactions. It’s worth noting that cAMP is a derivative of Adenosine, specifically the phosphorylated form. An ATP molecule will donate the energy from two of its attached phosphate groups (a “pyrophosphate”), and be left with one last lower-energy phosphate. When exposed to Adenylate Cyclase, it undergoes a dehydration reaction (losing an -OH and H, which join together as a water molecule), forming a pentacyclic group. This reaction is reversed by the enzyme Phosphodiesterase. Caffeine happens to be a Phosphodiesterase inhibitor, and it was originally thought that it was that property that granted Caffeine its pharmacological effects (Green et al. ), but compared to the amount of Caffeine required to competitively inhibit Adenosine receptors, it takes 20 to 50 times as much to inhibit Phosphodiesterase. (ibid, Snyder et al.) Given enough Caffeine, it will likely have some effect on maintaining the cAMP a bit longer, but it’s a secondary effect. The primary effect, rather, of Caffeine’s presence as it collects in the central nervous system, is that it competitively inhibits the binding of Adenosine. Both A1 and A2a receptors are “Purinergic” receptors, as mentioned earlier. Caffeine, in micromolar concentrations, muscles its way onto those receptors and leaves Adenosine out in the cold, waiting for a seat to open. While it seems that Caffeine will antagonize both A1 and A2a receptors with impunity, as antagonists are wont to do (Ramkumar et al. ), Corradetti et al. found no apparently correlation between the presence of caffeine and the low-affinity subtype of the A1 receptors. The high affinity sub-type, however, is strongly affected. So much so, that there is actually a measurable up-regulation of high-affinity A1 receptors. While Green et al. found no evidence for an increase in a total number of receptors, believing instead that the increase of High-affinity subtypes was simply low-affinity sites “kicking into high gear,” Ramkumar et al. specifically tested for this phenomenon using some radioactive Xanthine analogues (a “radioligand”). They hypothesized that if it was solely a shift in sub-type, but not an overall increase, the radioligand, which as an antagonist would not differentiate between high and low sub-types, would bind just the same either way. What they discovered, however, was that the total amount of radioligand utilized, and therefore sites available, increased after prolonged exposure to the Xanthines. This clearly indicated an increase in the total number of receptor sites, specifically the high-affinity subtype. The downside to up-regulation, of course, is that this is precisely why we buildup a tolerance to caffeine’s psychoactive effects. Nerve cells attempt to compensate for the inability to bind receptor A1, so more high-affinity sites are created. (This is quite possibly due to the sustained elevated levels of cAMP) As long as there are Xanthines present to maintain that blockade on the Adenosine receptors, things are normal, but when that blockade dissipates as the Xanthines are metabolized, all of a sudden the body is left with a swath of Adenosine receptors but an unchanged quantity of Adenosine. Adenosine binds to these sites quickly, and symptoms of withdrawal are felt. The question of exactly how Xanthines compete with Adenosines is unclear. 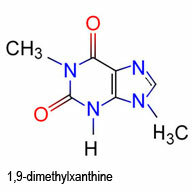 One of the metabolites of Caffeine is a demethylated version called Paraxanthine. The only difference is a single methyl (CH3) group is substituted with a Hydrogen. Bruce et al. noticed that the levels of Paraxanthine rose up to the 5 hour point, correlating with the typical effects of caffeine consumption. Following that timeframe, other metabolites increased and the effects declined. Snyder et al. 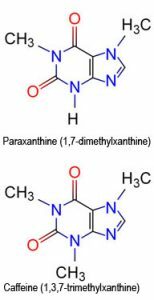 performed some of their experiments on rodents using both Caffeine (1,3,7-trimethylxanthine) and Paraxanthine (1,7-dimethylxanthine) simultaneously with no noticeable difference in the immediate effects. Changes in duration due to the pre-metabolized states were not noted. Interestingly, a nearly identical compound, 1,9-dimethylxanthine, was found to “not penetrate well into the brain.” (Snyder et al.) There is clearly some significance to the exact conformation of the Xanthine and how it affects the Adenosine receptor, but it’s unclear specifically how that is. The second banana to the Adenosine A2a receptor is the co-localized Dopamine receptor D2. As if the decreased agonist-affinity caused by A2a wasn’t enough, dopamine receptor sub-families D1 and D2 have what’s called “obligatory synergism,” meaning that if they don’t fire together, they are unable to fulfill the functions of dopamine. (Cieslak et al.) Introducing an antagonist of either one will prevent efficient use of the other. (ibid) The Dopamine D2 receptors are associated with mobility and locomotor activity (i.e. physical body movement). (ibid) Stimulation of the A2a receptor, causing the D2 receptor to be inhibited, results in sedation and catalepsy. The disease commonly known as Parkinson’s Disease is a neural degenerative disorder that degrades the dopaminergic system, among others, and results in a loss of control over fine motor skills, also among other things. In Parkinson’s patients, inhibition of Adenosine A2a with simultaneous activation of D2 showed marked improvement in mobility. (Cieslak et al.) Past treatment methods have also included the well-known L-DOPA trials (L-3,4-dihydroxyphenylalanine) and dopaminergic receptor agonists. (ibid) The effects of Amphetamines and Cocaine have also been observed; although they are also alkaloids, they favor binding to the D1 receptor sub-family of the dopaminergic system. Consumption of small quantities of caffeine on irregular intervals is beneficial. Staggering the intake schedule should prevent the otherwise inevitable upregulation of adenosine receptors that lead to tolerance (and ultimately withdrawal), and allow for maximal benefit with minimal consumption. In addition to the apparent prophylactic effect against Parkinson’s and the increase in mental acuity, the vasodilatory effect help to curb high blood pressure, provided excessive quantities aren’t consumed. Like all things, moderation is key. Ramkumar V, Bumgarner JR, Jacobson KA, Stiles GL. 1988. Multiple components of the A1 Adenosine Receptor-Adenylate Cyclase System are Regulated in Rat Cerebral Cortex by Chronic Caffeine Ingestion. J Clin Invest 82:242-247. Green RM, Stiles GL. 1986. Chronic caffeine ingestion sensitizes the A1 Adenosine Receptor-Adenylate Cyclase System in Rat Cerebral Cortex. J Clin Invest 77:222-227. Bruce M, Scott N, Lader M, Marks V. 1986. The psychopharmacological and electrophysiological effects of single doses of caffeine in healthy human subjects. Br J clin 22:81-87. Corradetti R, Pedata F, Pepeu G, Vannucchi MG. 1986. Chronic caffeine treatment reduces caffeine but not adenosine effects on cortical acetylcholine release. Br J Pharmac 88:671-676. Greene RW, Haas HL, Hermann A. 1985. Effects of caffeine on hippocampal pyramidal cells in vitro. Br J Pharmac 85:163-169. Snyder SH, Katims JJ, Zoltan A, Bruns RF, Daly JW. 1981. Adenosine Receptors and Behavioral Actions of Methylxanthines. Proceedings of the National Academy of Sciences of the United States of America 78(5):3260-3264. Gale Encyclopiedia of Mental Health, second edition. Caffeine-related disorders. 195-198. A good cup of coffee costs about tree fiddy. Excellent article. A little over my head but I still enjoy finding out the real science behind anything. Thank you for taking the time to share this. I followed the link from your comment on the other post about the real effects of caffeine on you brain. I am glad you commented since you had in-dept knowledge of the subject. This is very interesting especially if you like coffee. I usually drink coffee when under stress as it seems to relax me. Thanks for the great article! Great paper on the chemical mechanics of caffeine. It really is amazing how caffeine affects people differently. Of course your paper made it easier to understand why. Hi, your explanation of the neuropharmacology is excellent. You break down the jargon with good metaphors. Thanks! FYI, methylphenidate and nicotine are both neuroprotective like caffeine from what read anecdotally in the literature (probably works on multiple levels including preventing neuronal apoptosis). I haven’t found the same for amphetamine (more agreement that its neurotoxic, at least in higher doses in rodents). I recall some earlier studies in the 1970s, maybe early 1980s, where initial research proved that adenosine agonists where comparable to benzo’s for decreasing sleep latency. I don’t recall why they didn’t try to come out w/ a adenosine agonist tranquilizer (anxiolytic/hypnotic). I’m just depending on my long-term memory for these comments, so I maybe wrong. Anyways, can you post a nice pdf version (clean w/ no advert’s) of your term paper or email it to me? Thanks again. Forgot to say, I took the SVG version of the caffeine molecule from wikipedia, made some tweaks to it with Inkscape, and printed a large poster version to post in office a couple years back. I got the idea from a mug w/ the same thing on sale online on some site. Sure thing Jorge! I believe I have a versionlaying around somewhere. Will post here and notify you when its up. I really enjoyed your article. I have always wondered why drinking coffee makes me feel good, it improves not only my energy, but my mood. When one is deficient in a certain nutrient and supplements, one can feel a relief on symptoms. Drinking coffee, and making me feel good, cannot be a sign of “coffee deficiency” What conclusion can be drawn from this experience, and where can I look to improve?